Japan, 1988 Colour – 88 min. 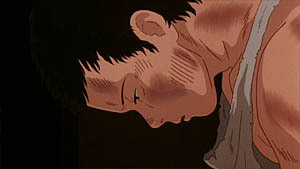 “21st September 1945, the night I died” — thus begins 14-year-old Seita's (Tatsumi) narrative. 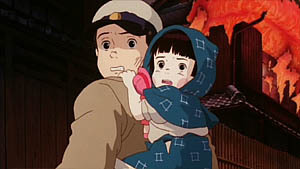 Moments later, the boy's spirit joins his sister, little 4-year-old Setsuko (Shiraishi). In flashback, Seita relives the two brothers' last days at the end of World War II. Another bombing being eminent in Kobe, the boys' mother (Shinohara) heads towards the shelter hoping to reunite with them later. But that will not happen. From this end, it may not be easy to conceive that Grave of the Fireflies was produced side by side with Totoro by Studio Ghibili, for a double feature premiere in April 1988. Both are emotional works, each one in its own way, but Miyazaki Hayao's film is a celebration of childhood imaginary while Takahata Isao's is a realistic report of the cruelty of war, impossible to sell to an entertainment eager audience. According to the director, in the interview available in Central Park Media's DVD [see below for details], the double feature did not always take part following the same film order. 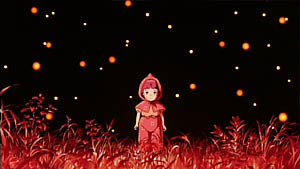 Whenever Totoro was shown first very few remained to watch Grave of the Fireflies, but if the opposite occurred the audience would leave the theatre feeling pleased. It is interesting that at the time Totoro was the film regarded as “a hazard”, for Takahata's film was adapted from a known socially and historically relevant book. Roger Ebert, whom Central Park Media used and “abused” to promote Hotaru no Haka, was not afraid to state that Takahata's film should be included in any list of the best war films ever made. It is, indeed, a work that displays a rare dramatic strength, a powerful portrait of the backstage of a conflict that destroyed nations and claimed the life of thousands. 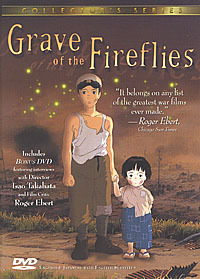 It's not easy to be prepared for the intensity of a film like Grave of the Fireflies, being “an animated film with kids”, but its introduction, revealing from the start the death of the two children, prevents any illusions. The text unfolds along a flashback that begins with an air raid and the separation from their mother, followed by rationings, hunger and despair. An aunt lodges the children but the relation remains tense. 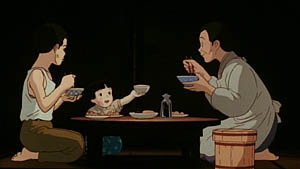 The film is constructed by small details and by the moments of interaction between Seita and Setsuko, their daily routines, adapted and conditioned to the difficulties brought by the bombings. The art is simple, although Takahata intended to experiment on the graphic design. But the premiere was already set and the need to comply with the schedule led to the option for a simple style in what concerns character design and functional animation — which do not undermine at all this outstanding work. Adapted from a 1967 novel by Nosaka Akiyuki, where the author includes autobiographic elements (1), with the late Kondo Yoshifumi (also storyboard co-author) who would sign Whisper of the Heart/Mimi wo Sumaseba in 1995, as animation director. (1) The always-recommendable site Nausicaa.net includes a transcript of an interview with Nosaka where he refers to have lost a sister at the end of the war in a way similar to what he described in his book. Nosaka is also the author of the book that originated The Pornographers (1966) by Imamura Shohei. Distributed twice in the USA on a DVD by Central Park Media (first edition R0, second R1). The most recent edition has an improved transfer, keeping the English version and the original Japanese one, subtitled. Unfortunately, the English version is played by default. The extras disk includes interviews with Takahata Isao and critic Roger Ebert (12'), biographies of the director and the author of the original story, “Original Japanese Promo” (6'35), an historical perspective by authors Theodore and Haruko Taya Cook (12'20), “DVNR Featurette” (4'23) — a piece about image restoration and noise reduction —, “Locations, Then and Now” — a comparison between the film sets and recent photos of the portrayed places (2'34) —, storyboards of unused scenes, artistic gallery, original and American trailers. Even though Ebert makes interesting comments, the prominence given to the piece in which he intervenes is inappropriate. This piece is accessed directly from the main menu while Takahata's interview remains “hidden” in the “Production Extras” submenu. Although the DVD cover refers an interview with author Nosaka, he only appears briefly in the original promo. DVD-Rom options: English script (text in graphic mode, read only when executing the application), image gallery, links, prizes, review excerpts and credits. Disk 1 contains the whole film in storyboards (multiple angles). The French edition (Le Tombeau des Lucioles) also seems to be a good option. Nevertheless, it is more expensive and does not include English subtitles.